Posted on May 21, 2012 by Michel S.
James Fallows of The Atlantic — a highly-recommended journalist and blogger, for those who have not come across his writing yet — recently re-expressed his dissatisfaction with Gmail’s new UI; and mulled switching to Thunderbird but worried about memory usage. As someone who did the same transition a while back, I remember going through that issue and then some. Memory usage, lack of integration with Google Contacts (exacerbated with the seamless contact sync of Android phones), a UI that makes it hard to manage multiple email accounts, and vertical space being taken up by the menu bar. Memory usage – a well-documented problem; the solution is to not synchronize your All Mail folder. Drafts folder – an advantage of using Gmail’s drafts folder, instead of the local one, is that you can access drafts from other computers. A drawback, though, is that TB auto-saves regularly as you edit your message, and if you use an IMAP folder, it discards old drafts by moving them to trash. The Auto Save Drafts Folders extension let you adjust this behavior (in Copies & Folders); just use the local drafts folder for auto-saved copies. Compact menu – Firefox’s main menu has recently been reworked, but Thunderbird’s has not; you can use this extension if, say, you use a widescreen laptop and want to recover vertical space real estate. Hope that’s of some use to some folks! This entry was posted in FLOSS. Bookmark the permalink. In the native GMail web interface, it is possible to search for mail containing certain phrases in the message body. 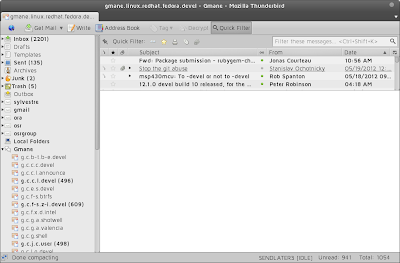 Is this functionality available in Thunderbird with GMail? What about any other non-GMail mail server that supports IMAP or POP3? This would be a great article to revisit with all of the changes that have come down the pipeline in Thunderbird.